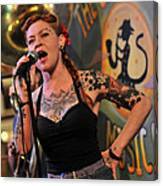 Meschiya Lake At Spotted Cat by Steve Archbold - 7.875" x 8.000"
Meschiya Lake At Spotted Cat art print by Steve Archbold. Our prints are produced on acid-free papers using archival inks to guarantee that they last a lifetime without fading or loss of color. All art prints include a 1" white border around the image to allow for future framing and matting, if desired. 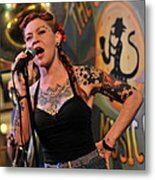 Meschiya began her singing career at the age of nine, earning a regular gig and winning $500 upon winning an adults only singing contest in a South Dakota Steakhouse. In 2000 as a young woman, she met and began traveling with the Know Nothing Family Zirkus Zideshow and End of the World Circus - a troupe blending traditional circus arts with modern sideshow varieties where Meschiya honed her performance skills with such thrilling acts as glass and insect eating and fire dancing (dangerously twirling around on stage with flame-doused nunchucks). 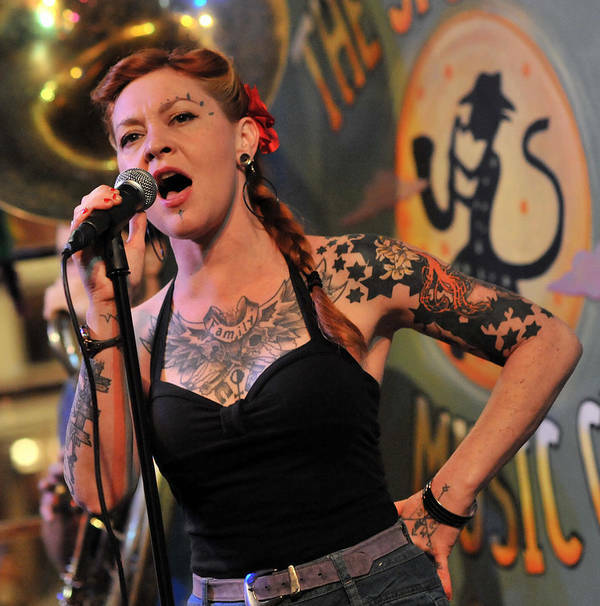 It was while touring with this troupe that she fell in love with and felt immediately embraced by the culturally rich and one of a kind city of New Orleans, her home base for the last decade and counting.